So here's something pretty amazing: scientists in Korea have created a thin, flexible, transparent skin patch that can monitor your health, store the information and deliver a treatment. That is a really impressive feat of nanoengineering. 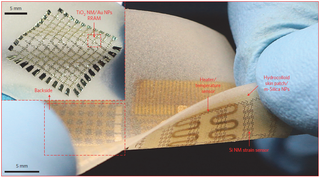 While similar health monitoring systems exist, there are none that have started from the ground up to determine the optimal materials and designs for wearable electronics that must maintain intimate mechanical contact with soft tissue. The authors first manufactured an array of non-volatile nanoscale random access memory based on gold nanoparticles embedded in a titanium dioxide nanomembrane. This was mounted on a polymeric patch to which they added strain sensors, temperature sensors, and resistive heating elements all united by super thin serpentine wires. On the underside of the patch, they added a bunch of drug-loaded silica nanoparticles. By keeping all the components of the patch at the nanoscale, it could be made thin and flexible enough to conform to human skin. Under testing, the memory maintained full electronic function and did not delaminate even when the patch was strained by 25%, more than would ever occur on human skin. It also passed the bending-and-twisting trials. The primary application for this sort of technology, in the near term, is in monitoring and treating movement-related neurological disorders. Things like Parkinson's disease or epilepsy. The strain sensors of the patch could keep track of muscle tremors and record the data in the memory. After analysis of the data, treatment could be provided by the drug-conjugated nanoparticles, which diffuse through the skin upon heating by the resistive heaters. The on-board temperature sensors can act as feedback to ensure the skin isn't burned. As an added bonus, all the work the researchers did in finding the best materials for each component of their patch will benefit everyone working in this field. Which will in turn benefit the rest of us. Personalized nano-healthcare, it's coming. Check out the original paper, Multifunctional wearable devices for diagnosis and therapy of movement disorders, at Nature Nanotechnology.